This was the first dress that I made following my sewing hiatus. I put this dress together from cutting to hemming in one day — or about 6-7 hours or so. The only thing that I didn’t finish on it was the belt, but honestly, I’m happy wearing a RTW belt with this dress. The pattern I used is Butterick 5982. It’s a simple pleated and gathered dress with neckline and sleeve variations, plus it has the option to make a skirt with contrasting colors. This dress has an early 1960’s feel and is similar to one of my favorite patterns, Simplicity 2444. I might actually like this pattern a little better. It’s easy to put together and sew and doesn’t have many pattern pieces which makes it a bit quicker to put together. I like both the V and the boatneck and the silhouette is one that compliments me. In fact, I already made another version and plan on making at least two more! It’s a very versatile pattern as well as being quite comfortable to wear. This version is made of a red linen/rayon blend fabric that I found at Joann’s. I had been eyeing it for a little while and finally decided to purchase it. I am really liking linen blends this year and along with eyelets, I think they are going to be my “go to” fabrics for spring and summer. I lined the bodice with white cotton batiste, but unfortunately didn’t get a photo of the inside to show you. This pattern has pleats in the front and back with gathers that run from front to back. I wasn’t following the directions and failed to notice the “gathered” part on the piece, so I didn’t do any gathering on this dress. Instead, I continued with the pleating as there was extra fabric…. yeah…. dummy….. extra fabric for gathering! Unfortunately, I learned a lesson whilst wearing this dress. I am pretty lazy about pre-treating fabrics…… I do it with challis and wool blends and fabrics that I think might shrink in the wash or when dry cleaned. This is the second time I have worked with linen and the previous time I didn’t prewash the eggplant linen that I used with no problem and yet this one DEFINITELY CAUSED ME A PROBLEM. I wore this dress the day after I made it to a sewing/quilting show in San Mateo and it bled all over my white purse. 🙁 Yes, this red dye leaked all over and stained. It even left red marks on the tan interior of my car! I’m guessing that body heat + red dye = a big hot mess. That was indeed a lesson to me and you can learn by my mistake and be forewarned of bright red dye and linen — especially this one from Joann’s. I have been working on the stains on my white purse, using a mixture of distilled white vinegar, Dawn and water and it’s been fading. If you have any other advice — let me know! It’s a white vinyl Dooney and Bourke that I just got for Christmas from my husband, so not something that I want to dispose of. For the back of this dress I put in an invisible zipper that I exposed a little bit as I wanted a little contrast in the back. I also took out the back dart in the bodice as I wanted a little more room, but I wish I would have just left them there. With my next version I did leave the back darts and liked it better. And how do you like my photobomber in the background? Overall, I really do love this pattern. It’s a classic and clean silhouette which can be dressed up or down and I’m looking forward to making a few more! Hello! I saw this post, and just ordered the pattern. Weee ha! I hope you enjoy it, Kathy! I think they forgot something as they list salt but don’t tell you what to do with it. Based on another article it appears you should add 1/4 cup salt to the wash every time for added protection against bleeding so I assume the salt should be added to the second step in the article I referenced. I only needed one handmade garment to shrink to learn the lesson to prewash fabric in same manner garment will be washed – now I know to check reds for colorfastness also! Lovely dress on a lovely lady. Just found you through the Colette blog tour – can’t wait to see the rest! Thanks, Rox, I will check it out. Yes, I’m very lazy about that!!!!! Learned my lesson! Red looks lovely on you! The dress is an adorable style and great fit! It’s too bad that you had issues with color bleeding. :-/ Maybe you could soak it in a bath with some salt and then lay it flat to dry. I’ve heard salt sets dye. Good luck. Thanks, Michelle! That’s a good idea. I think I’ll try that! RED HOT MAMA! who needs a self fabric belt! and i love that you went with pleats instead of gathers, i think it makes the dress. this is an insane suggestion… mr clean magic sponge for the purse? you’d have to be verrrrry careful and gentle to only take off the layer of dye, but i think it could work. probably a last resort kind of thing. Thank you! I’ve never used the magic eraser. I think I may try that if I don’t make any more progress on the stain. I washed a red linen tablecloth that must have been washed over 30 times. I didn’t notice that a cream and an ivory were in the washer too. Unfortunately, the two lighted tablecloths are ruined. Red will bleed forever. I it unless it is polyester. This red looks beautiful on you. Perhaps a whole wardrobe of red? Thanks for the cautioning words! I guess I still need to be careful when I wash this! If i see any more cool red fabrics, I guess I’ll have to scoop them up! I was on a fabric buying moratorium, but have been just trying to stick with certain colors when shopping. Wow! This dress is a real stunner! I love this colour on you and the fit is amazing… I would not have taken a second glance at that pattern, but after seeing your version, I may add it to my list of patterns to buy. Can’t wait to see the next one you make! I feel your pain about the stains! I too made foolish (and LAZY!) decisions about not washing fabric… Until I shunk a top in the wash! So annoying! I think I’d prewash any linen from Joann! I washed this dress by itself and so much dye came out! Turned the white lining pink. This dress looks soooooo good! You got such a nice fit and the color is gorgeous. I saw your review on PR and had to comment. The fit is SPOT ON. The length, belt, v-neck – everything is on point. This is a statement piece and is fabulous. Very well done. It looks great! Red is definitely one of your colours! Thanks, Amanda! Yes, red is indeed one of my colors. And can you believe that I was never a fan of it before? Really!? I just made a red linen top and didn’t wash it first!! Aaaggghhhh! Wow this is a stunner! Love the v neck and skirt. Thanks, Jenny! I will try that next! 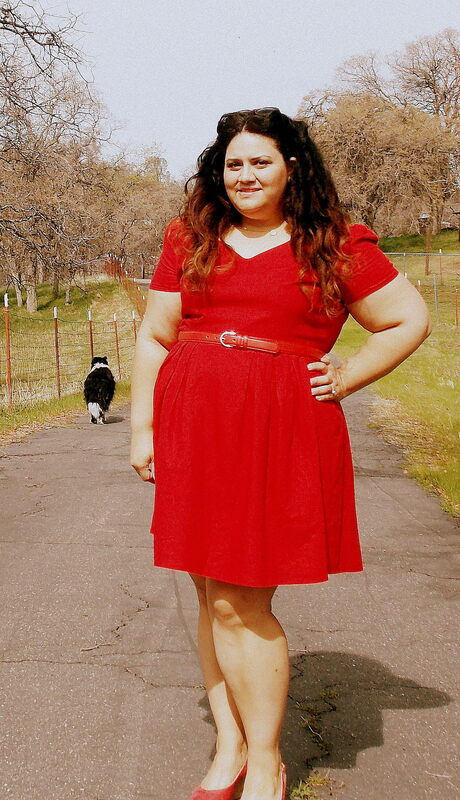 Love your red dress – nothing makes a statement as mush as scarlet. I’m so pleased I’ve seen your post as this pattern wasn’t even on my radar but it looks so fabulous that I’ve now added it to the list! Thanks for sharing. I highly recommend this pattern. I guess it’s not an many sewers’ lists as I just wrote the first pattern review for it. I can see this pattern made it a variety of fabrics.